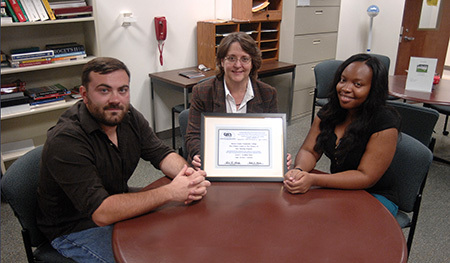 West Windsor, N.J. – Mercer County Community College’s (MCCC) Peer Tutor Training Program was recently stamped with a major seal of approval. The program has earned the College Reading and Learning Association’s International Tutor Training Program Certification (CRLA-ITTPC). The new credential means that MCCC peer tutors, including those who have completed the training since Spring 2013, will receive Lifetime Certification as a Certified Tutor, Level I. According to the program’s coordinator, Assistant Professor of English Barbara Hamilton, thus far seven students have earned certificates and two more are finishing up the required hours to gain certification. Training will begin for a new group of peer tutors this semester. displays the certificate from the CRLA. Hamilton couldn’t be more pleased. “This is a goal we have been working toward for several years, ever since the training program was first designed,” Hamilton said. Original funding for Mercer’s peer tutor training program came from a Student Learning Improvement Grant awarded by the MCCC Foundation in 2012. Hamilton notes that Mercer’s training program joins the ranks of CRLA-ITTPC programs at Bergen, Ocean, Passaic, and Raritan Valley Community Colleges. “We are all able to certify peer tutors who have completed a rigorous on-site and online training process,” she said, adding that tutors must also complete 25 hours of actual tutoring as the last step in their training. “These peer tutors have demonstrated their professionalism, empathy, ability to build rapport, and expertise in facilitating the growth of critical thinking, reading, and writing skills of other students. Our students can take this valuable credential with them as they transfer,” Hamilton notes. Other CRLA-ITPPC certified colleges and universities in the state include The College of New Jersey, Monmouth, Montclair, Rider, Rowan, and two Rutgers campuses. Describing ITPPC’s thorough review of the Mercer program, Hamilton says the organization found much to praise and nothing to criticize. “Our training program was commended for its easy-to-follow organization, its continuous support for the novice and experienced tutor, and its recognition of the unique needs of students,” she said, adding that one reviewer reported that the framework for tutor recruitment and training is worthy of consideration as a CRLA model program, particularly the user accessibility and online content interface available through the online platform. The initial CRLA certification continues through September 2015. An application for a three-year certification will be submitted at the end of the current academic year.